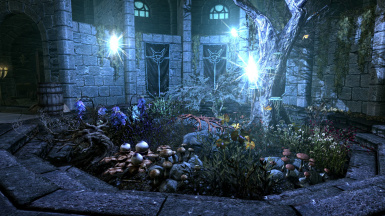 Fixes bugs relating to harvestable objects in Skyrim, including the Flora Respawn Bug. Improved sanity checking in one of the scripts. Removed edits to the flora version of the Sleeping Tree Sap Spout, which wasn't actually used in-game. Plugin is now flagged as a master file for improved patch support. Complete rewrite. Now works on existing saves. FloraSaveFixer tool only needed for switching from Flora Respawn Fix or an earlier version of this mod. Added harvest animations to all harvestable dead animals. Gave distinct names to the two Birds' Nests. Respawn timers are now reset if the cell is visited before respawn time. This should keep things synchronized with the rest of the cell reset. Script improvements to reduce log spam about activate parents. Yellow Mountain Flowers now have distinct names as well. Mountain Flowers now have distinct names. Fixed broken script on Sleeping Tree Sap Spout. Mesh patches contributed by x0ne to include fixes from Mindflux's Particle Patch for ENB. Minor script tweak. Plants that have an animation added after they are harvested will appear harvested next time the cell loads. - Added visible harvest behavior to several objects that didn't have it. - Fixed several minor issues in vanilla meshes. German by Ovaron - http://www.nexusmods.com/skyrim/mods/70905? Spanish by EHPDJFrANKy - http://www.nexusmods.com/skyrim/mods/71333/? Italian by riccardo83 - http://www.nexusmods.com/skyrim/mods/71505/? - For games that have not had Flora Fixes or Flora Respawn Fix installed, no special steps are necessary. Install manually or with the mod manager of your choice. - For upgrading from an existing install of Flora Fixes v1.x or Flora Respawn Fix, run the FloraSaveFixer tool on the save you wish to continue from.